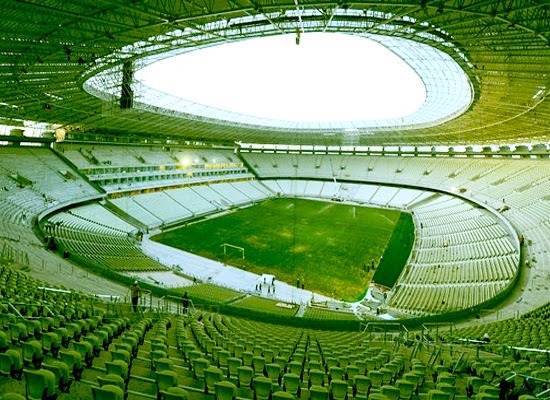 The Castelao is the first “Green” stadium among the 2014 FIFA World Cup Brazil venues. Out of the 12 stadiums that applied for Leadership in Energy and Environmental Design (LEED) certification, the Fortaleza venue is the first to be awarded the certificate for its exemplary building methods with regard to sustainable sites, rational water use, energy efficiency, indoor environmental quality, use of environmentally friendly materials and implementation of innovations. The purpose of the "green" atmosphere is to spread awareness about sustainability and its practical applications. The idea is to show people that they can help the environment and how it can benefit themselves. There is a no-smoking policy is in place for all indoor areas and outdoor zones within eight metres of the air vents of the buildings, and suitably sized waste centres have also been integrated into the complex to store recyclable waste such as paper/cardboard, plastic, glass and metal, which is collected on a regular basis. This event will not only bring people together to celebrate the sport and competition but also to leave a message that its important to take care of the environment.